Hard evidence for this population of planetary nomads has proved elusive—floating cold and lightless in the void, these dark worlds cannot be directly observed by any conceivable telescope. …space is so huge that the chances of a rogue planet wandering close enough to our solar system to cause harm are, well, astronomically low. Very rarely, however, one might pass in front of a far-distant background star, creating a detectable blip of light as the planet’s gravitational field acts as a magnifying lens. The duration and strength of such a “gravitational microlensing” event could reveal not only a rogue planet’s existence but also its mass, as bigger worlds tend to create longer, stronger amplifications of a background star’s light. A typical free-floating Jupiter-mass planet, for instance, is estimated to create an amplification lasting one to several days. A smaller, Earth-sized object might only amplify a star for a few hours. The latest results of that census appeared on Monday in Nature, and come from Poland’s Optical Gravitational Lensing Experiment (OGLE), a 1.3-meter telescope in Chile. 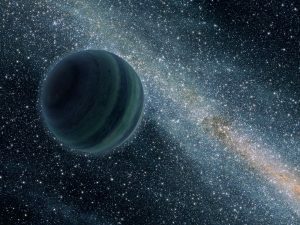 Based on a statistical analysis of more than 2,600 microlensing events, drawn from six years of observations on about 50 million stars, the OGLE team estimates that there is perhaps one Jupiter-mass rogue planet for every four stars in the galaxy. Those earlier estimates of giant rogue planets being twice as common as stars sent shockwaves through the astronomical community when they emerged in a 2011 Nature paper from the Microlensing Observations in Astrophysics (MOA) survey, which uses a 1.8-meter telescope in New Zealand. The puzzling nature of the MOA results can be understood by imagining Jupiter-sized planets being a bit like sumo wrestlers, says Douglas Lin, a planet-formation theorist at the University of California, Santa Cruz. Astronomers have predicted such objects for decades. In Lin’s analogy they would be the “babies” ejected by the Jupiter-sized “sumos” in embryonic planetary systems. Some have even speculated that these tiny exiles could be habitable, harboring subsurface oceans kept warm and liquid by the decay of radioactive elements, shielded by crusts of ice or thick hydrogen-dominated atmospheres. Habitable or not, evidence for the existence of this class of free-floating world has to date remained circumstantial at best because their microlensing effects are so short and difficult to see. Experts—including members of the OGLE team—view the survey’s claimed detections of such low-mass microlensing worlds with measured skepticism. This article is reproduced with permission from Scientific American. It was first published on July 24, 2017. Find the original story here.